My love of Shih Tzu's began in 1998. I was home from work after a back injury and my husband and I were also in the process of building our new home. The plan was once our home was built , my husband would get his Boxer that he always wanted and I would get my German Shepard. As life would have it nothing ever goes as planned. We fell in love with Chip and Dale the very first time we saw them. They were a year old, and were being housed outside in a long large dog run. They didn't run when they first saw me or wag their tails. There was really no emotion at all. All they had was each other. I took these little boys home and they changed my life forever. 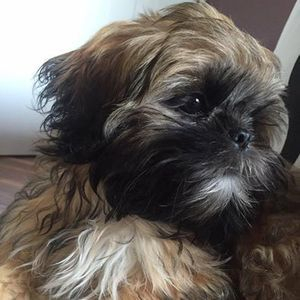 I have been breeding healthy well adjusted puppies for 20 years now, and have always offered a 5 Year Health guarantee, I have been fortunate to start out with the Best Shih Tzu from some of the Best Shih Tzu breeders out there who long before me showed and made sure they bred nothing but the best . We have never had any kidney, liver, heart , eye , hip , skin problems , we have just never had any issues all our dogs get regular Health checks , vaccinations as needed . 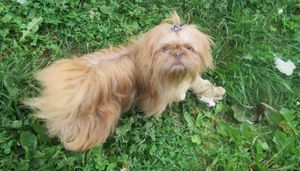 ChipandDale ShihTzu is located in New Brunswick Canada. We are 20 min from the Village of Chipman. Aprox 1 and a half hours from Fredericton, St. John and Moncton. I am not a member of the CKC, but I do breed CKC registered Shih Tzu , but I also breed non-registered Shih Tzu, whose lines originated from my very 1st 3 Shih Tzu; from back in 1997. 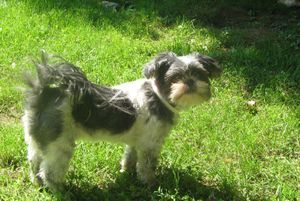 The Canada Pedigree Act has strict rules as to selling of Pure Breed Dogs . You do not have to be a member of the CKC to register pure bred dogs " It is a registry " that is it. I also breed Pure bred Morgan Horses and " The law states that all pure bred animals should be registered" So these registries are in place so we can do just that. Even without member ship. Being a member of any of these organizations does not make me a better and more trusted breeder. Our first girl Lulu below at 15 years old the year before she passed away. 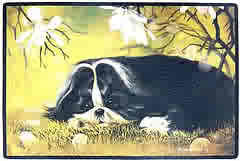 ChipandDaleShihTzu is licensed by the NBSPCA. We are not a Kennel with cages and outside kennels and housing. Our dogs live in our home with us and are part of our family. Any dog we have bred are our family , and they stay here with us " Forever"
ChipandDale's are now producing some new colors besides the traditional colors of gold and white and red and white and tri's we have had solid black's , dobbies both in gold and reds and this year dark dobbies, brindle's and sable's , chocolate, solid colors like red, and even blues. Blue as described does not necessarily mean a blue Shih Tzu, but yes we have had our first this year out of Jolene a beautiful blue boy. But to qualify for the name blue. The nose, the pads etc have to be blue, it does not necessarily mean the color will be blue. We also had a blue " Sable girl" out of Jolene. She is a beautiful sable color with blue skin , pads and nose. And we also have had Liver colors and Lavender. We are trilled at a new breeding and in anticipation to see just what new color we will produce. They are all beautiful and it's been a joy to watch them change and grow .